Well Friday night my wife had a hankering for Saucijzenbroodjes, which are Dutch sausage rolls. They're super easy to make and only require 3 things... Sausage, Puff Pasty and an Egg. So I whipped up a batch. 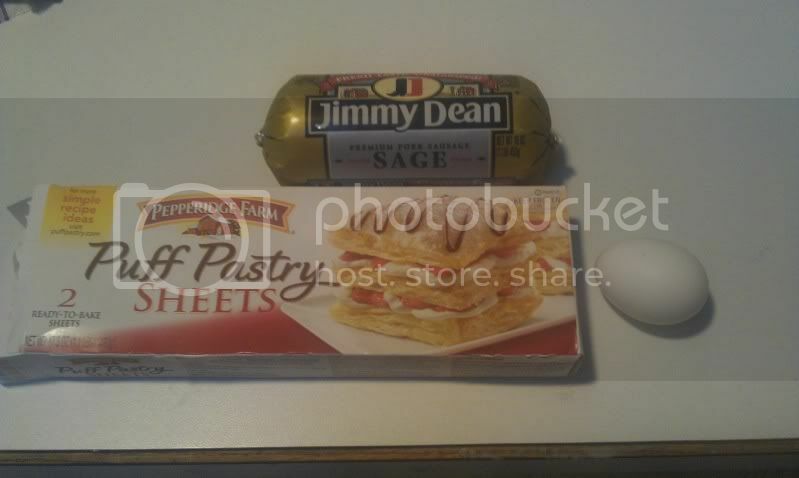 The original recipe is ground beef/pork mixed with Mace, Nutmeg and Black Pepper, but I'm lazy, so I just picked up a chub of Jimmy Dean Sage flavored. Mighty tasty. 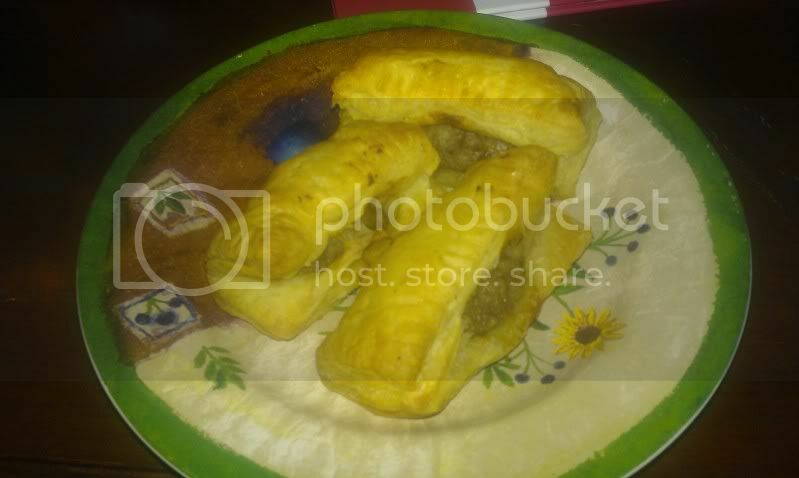 Cut the puff pastry into squares, fill with the sausage, fold close and crimp. Brush with egg wash and bake in a 350 degree oven about 30 minutes, or until the tops are nice and brown. I over-filled these, which I always do and they blew out the side, but they still taste awesome. these look really good! i would like to give them a try soon! do you have the original recipe lying around anywhere? Funny you should ask... I'm getting ready to post something soon that I think you'll enjoy if you're looking for authentic Dutch recipes. But short answer, yes. I'll get it when I get home and post it for you. Pigs! (a.k.a. pigs-in-a-blanket) I've eaten lots of those! I've always seen them made with a short dough, though, never with puff pastry. That way they come out more like miniature Cornish pasties than like some Frenchified hors d'oeuvre. Of course, lots of cultures have some sort of sausage roll, and maybe the Dutch have more versions than what I am familiar with, but that's how I remember pigs in Dutch-American communities. Yes, there are lots of different varieties of these, and they often go by different names, usually depending on the region. Example, my family calls what I made above sausijzenbroodjes, but if you ask my Uncle's wife, that comes from a different region of Holland what a saucijzenbroodje is, she'd come up with pretty much the same thing, except with cased (link) sausage, which we call a Worstenbroodje. What you're describing is more of what we'd call a Saucijzen Rollen. But again, it just depends on where you are and where you came from. Many different terms all mean the same thing, especially with the old recipes. u the man - thanks! it's all good, as far as i am concerned! yep yep! To me, when you say pig in a blanket I immediately think a breakfast sausage wrapped in a pancake. Mmmm. So many local varieties of the same thing. and they're all good ~ i'd like to try these saucijzenbroodjes - they look like a perfect thing for this time of year! I was looking through all of mom's old cookbooks while I was over there for easter today. 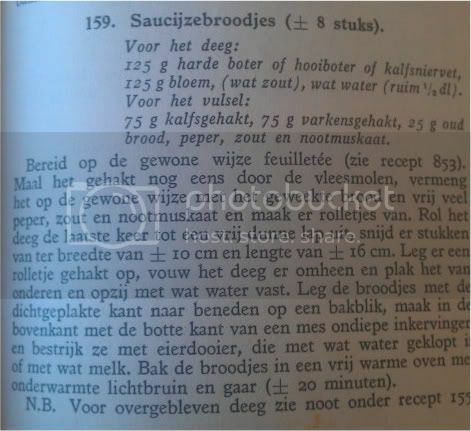 Here's a recipe for saucijzebroodjes from a turn of the century Dutch cookbook. My (probably poor) translation of it. Your cookbook must indeed be many years old, Mike. The first sentence "Bereid op de gewone wijze feuilletée.." says it all. 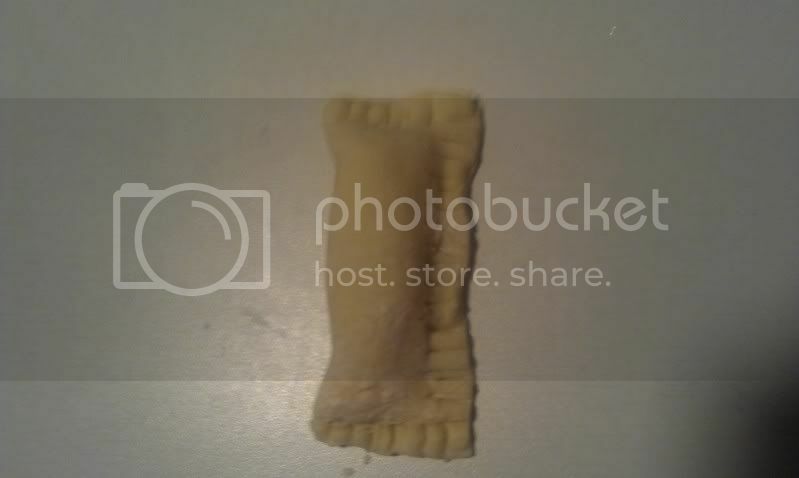 It says "prepare puff pastry the usual way". Indeed, feuilletée is none other than puff pastry. Any modern cookbook would have said; buy a roll of puff pastry. This recipe you posted dates from the time where people made their own puff pastry which is notoriously time consuming and difficult to make it right! We want more from that book, well, I do! I love to make "worstenbroodjes" (sausage breads) as we call them on occasion. There's a village nearby who has some sort of an regional recognition for very similar worstenbroodjes. They call them "piros", seems to be a recipe that goes back ages. We want more from that book, well, I do! there's a saying here in america, "ain't no school like the old school," and that certainly applies here. It's definitely an old book. I'm not sure exactly how old, because it doesn't have a printing date in it. But the foreword is dated 1910. It's the 11th printing, so the book itself is probably from the 1920s, but the recipe could be anywhere from 1890s-1920s. 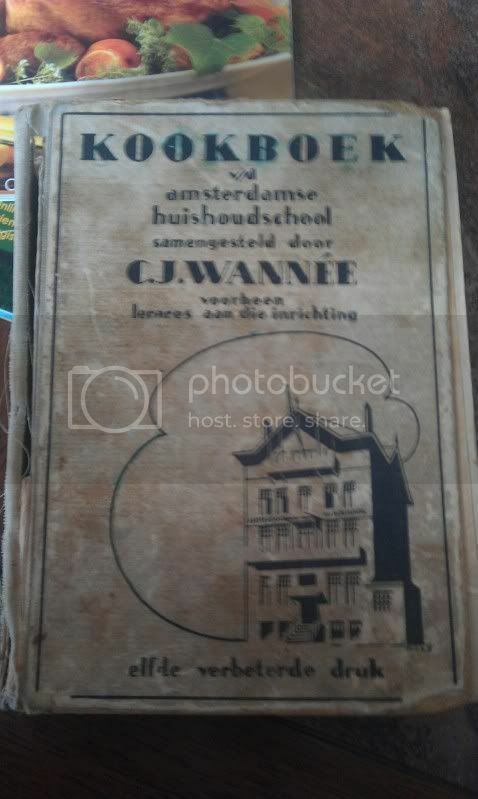 My Oma got it when she graduated from huishoudschool in the late 1920s. I've asked my mom to scan it for me when she can, I'd love to go through some of the old recipes and try to make some of them the old-school way. As a general thing, Ron, I certainly agree with this philosophy. But.....have you ever actually made puff pastry? There are certain things best left to professionals. IMO, puff pastry is one of them. It's pretty much like making croissants right? I haven't had the nerve to try that one yet either, but someday I will. but on the same note i really believe that to get down to it and elarn the fundamentals, you gotta do it like grandma or great-grandma did and at least try making it once or twice. to me (and this is just me, i don't expect anyone to agree) a person who makes a slightly-faulty puff pastry will get more out of the experience than a person who buys a perfect puff pastry. I'm pretty sure that none of my grandmothers or great-grandmothers ever made puff pastry. It has always been a specialty preparation made mostly by professional bakers or pastry chefs. If your grandmother or great-grandmother was lucky enough to have eaten puff pastry with some regularity and you want to do it just like grandma did, then the right approach is probably to buy finished product from someone else. One aspect of this is that home cooks, of necessity, try to be all things, and be equally good at them. There are reasons, though, why the savory side and the pastry side of a professional kitchen are run separately. Different skill sets, is why. Yeah, Ron, everybody should try everything at least once. No argument. But you remember the great words of W.C. Fields? "If at first you don't succeed, try again. Then quit. No sense making a damn fool of yourself." Me, I've had my tries at puff pastry. Now I'll let the pros do it for me. point taken, daikon ~ perhaps the puff pastry was a bad example of what i was trying to say. This is probably why there are variants like the short-dough-wrapped pig-in-the-blankets that I mentioned earlier: puff pastry was too much work, unavailable, or too expensive (the last of which would undoubtedly have been the opinion of my Dutch ancestors....) I can easily see Saucijzenbroodjes in puff pastry being an occasional, out-on-the-town treat, while the simpler pigs were more make-at-home staples.